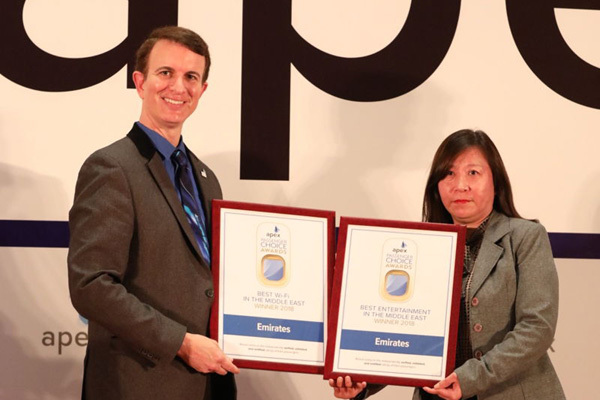 Emirates has received three Regional Passenger Choice Awards - Best Entertainment in the Middle East, Best Inflight wi-fi in the Middle East, and the Best Overall Experience in the Middle East - at the Apex Passenger Choice Awards ceremony held during Apex Asia in Shanghai, China. These are the most recent accolades awarded to Emirates, in addition to the five-star Global Airline Official Airline Rating and the Global Passenger Choice Award for Best Entertainment awarded at Apex Expo in September 2017. Based solely on verified and certified passenger feedback, the five-star rating is the highest in the programme. Emirates continually invests in its onboard product and has been at the forefront of innovation with its in-flight entertainment system, ice. It was the first airline to install in-seat personal screens in every class of service over 26 years ago and continues to enhance its product for a superior customer experience. Emirates has also invested heavily to provide in-flight connectivity and Live TV on board. Today, over 70 per cent of all Emirates’ aircraft offer Live TV, including all its Boeing 777-200LR and 777-300ER fleet. Wi-fi connectivity is available on over 98 per cent of the fleet, including all A380s, 777-300ERs and 777-200LRs and the airline also offers customers in all cabin classes 20MB of free wi-fi data.